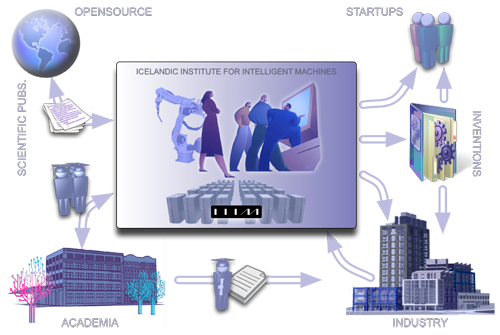 The Icelandic Institute for Intelligent Machines (IIIM / Vitvélastofnun Íslands) is a non-profit institute structured specifically to accelerate the rate of innovation for interested parties by strategically bridging between academic research and industrial engineering needs. Focusing on the areas of artificial intelligence, robotics, and simulation techniques we develop novel software tools, methods and systems exhibiting new levels of capability in numerous areas that take advantage of our expertise in machine learning and artificial intelligence, robotics, sensing, simulation, data processing, and other fast-growing areas in software development. Our work has relevance across a wide range of areas such as computer games, energy systems, bioinformatics, to virtual and augmented realities, and robotics. Our collaboration takes many forms, including contract work, grant proposal writing, prototyping – even basic research. Every project we undertake leverages our strong in-house expertise, project experience, and intellectual property assets, as well as a powerful knowledge network of highly qualified collaborators and experts. Together with IIIM Rögg produced a software, which quickly and accurately pinpointing the location of lost hikers in the dangerous highlands of Iceland. The software was installed in the Icelandic Coast Guards’s helicopter and can make a difference between life and death by shortening the search time in Iceland’s rough conditions. The prosthetic company Össur is a leading force world wide for improving people’s mobility with technology, research and innovation. The startup company Mesher makes a smart phone app, which helps people buy clothes on the Internet. The software is based on a highly developed computer vision and AI algorithms. IIIM strives to optimize the match between academic and industry needs, resources and goals, relieving members from the need to be on the outlook for opportunities, technologies, projects, students and resources. IIIM is a bridge between academia and industry, enabling academia to better relate to industrial needs, at the same time allowing industry to benefit sooner from academic results. 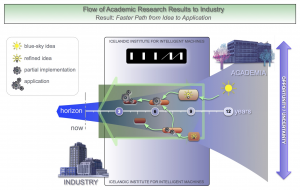 The 3-year horizon of most product development in industry (“3”, left-hand side) is met with IIIM’s 3-9 year horizon, connecting with the most advanced products on the industrial side with the further-reaching horizon of academic projects (“9”, right-hand side), at one decade or more into the future. Through exchange of ideas, people, projects, and intellectual property IIIM helps companies see further into the future, bring high technology to their product lines, and produces more advanced products faster. Since its establishment in 2009 IIIM has worked with a number of Icelandic high-tech companies and startups, including Össur hf, the National Commissioner of Police in Iceland, CCP, Rögg ehf, Mesher ehf, Svarmi ehf, 3Z ehf, and many others. For startup companies IIIM offers two comprehensive startup programs, the High-Tech Highway – giving companies quick access to IIIM’s entire network of experts, and the Accelerator – a formal but easy collaboration method well suited for high-tech industry and young startups. IIIM boasts of an extensive collaborator network both from academia and industry, including DFKI (Germany), Simula (Norway), Reykjavik University School of Computer Science. CADIA, RU’s AI lab, remains a close collaborator, a laboratory co-founded in 2005 by IIIM’s director and founder Dr. Kristinn R. Thórisson. The institute was founded in collaboration with industrial and academic institutions. These are CADIA, Reykjavik University School of Computer Science and CCP. Industrial members provide challenging practical questions, while universities provide doctoral students, postdoctoral associates, and research faculty.